Texans can’t get enough steak. The state is the largest beef exporter in the country. So when picking a steakhouse for a special night out, to impress guests, or simply to try for yourself, it’s important to know which takes full advantage of the Texas appetite. Here are the 10 best in the Lone Star State. Visit the Highland Hotel in Dallas, Texas, for a once-in-a-lifetime steakhouse experience. Knife is the wonderful effort from John Tesar, Bravo “Top Chef” contestant and three-time James Beard nominated chef. The restaurant has garnered tons of accolades, and their 240-day-aged steaks are absolutely worth it. Bohanan’s is, simply put, one of the best steakhouses in the country. Zagat defined the restaurant as: “A classic steakhouse done right, this much-loved downtown restaurant exceeds expectations with outstanding beef and an old-school vibe.” Expect to stay the evening and eat luxuriously. Brenner’s Steakhouse has been in business since 1936, and has racked up innumerable awards since then. They serve brunch and dinner with steaks, chops, and seafood as the main attractions. A recent reviewer of Four Wings Steakhouse in Wills Point, Texas wrote, “Anyone who’s stepped inside Four Winds Steakhouse has come out a changed person… it’s near impossible to have a bad meal here.” Works for us! 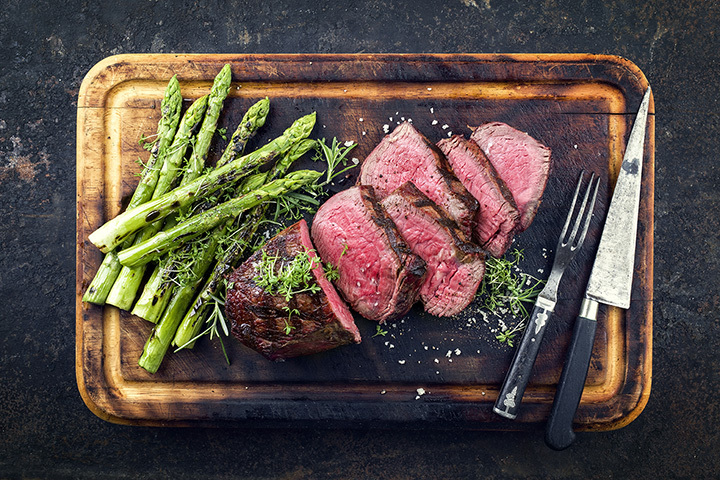 Find delicious options ranging from 26-ounce bone-in ribeye to a juicy New York strip. Killen’s Steakhouse in Pearland, Texas, is in the hands of Chef Ronnie Killen, previous executive chef at Brenner’s Steakhouse on the Bayou. The Houston Chronicle named Killen’s the “ultimate steakhouse.” Make sure to try his award-winning crème brulée bread pudding, one of Food and Wine Magazine’s “Top Ten Dishes in the United States,” for dessert. Cattlemen’s Steak House has been in business since 1947 and still offers that authentic, old-school vibe. It’s a fun place to hang out, with a saloon atmosphere and décor. They have a wide variety of steaks, including the 24-ounce Cattlemen’s porterhouse. The Son of Texas is a steakhouse that appreciates its roots. It is a celebration of all things Texas, including delicious steaks carved just right. Find options such as Texas ribs, beef tenderloin tips, and filet mignon. Winner of the “Best Burger in Texas” award from Food Network Magazine and named “3rd Best Steakhouse in Texas” by Texas Monthly, Perini Ranch doesn’t disappoint. Stay the weekend in the guest house to enjoy everything the menu has to offer. It’s recommended guests make reservations. Saltgrass Steakhouse is a 2017 Certificate of Excellence award recipient from TripAdvisor, as well as the “Best Steakhouse” Reader’s Choice 2017 for the Focus Daily News and Living Magazine. Saltgrass serves certified angus beef steaks in many verities. They have locations all over Texas. Escape high-society and enjoy a delicious steak in a rustic, down-home atmosphere. Ranchman’s in Ponder, Texas, has been in business for six decades and still uses the same recipes that made them famous.